With the Jewish holidays recently passed, and the baby in my belly asking me to eat a little more beef than usual, I felt like whipping up a brisket. 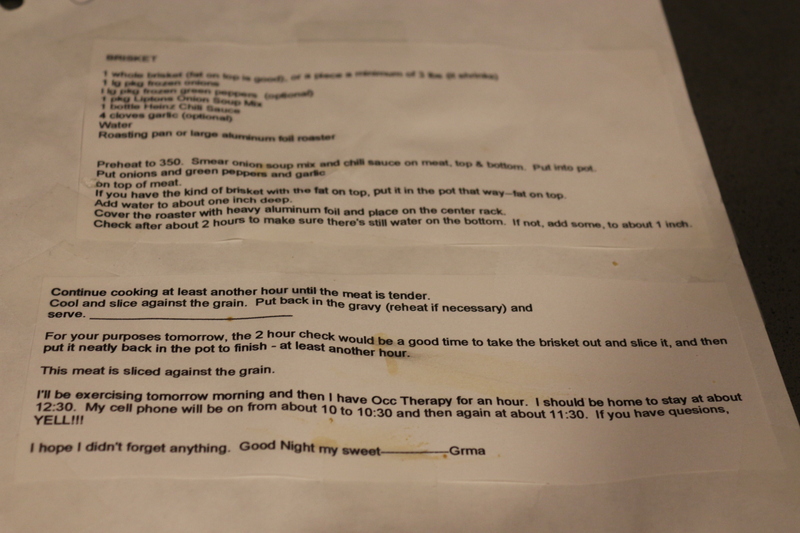 Grandma sent me this recipe while I was in college and decided to host my first Jewish holiday (I think it was Passover but can’t be sure). This recipe is pretty hands off – once the meat is in the oven (for literally hours), there isn’t much to do. Note that I use an electric knife to cut the brisket – per Grandma’s instructions. It’s the only recipe I ever use the electric knife for, and I actually use one that Grandma gave to me. But you can always use a regular knife if you want. This dish is warm, satisfying, and delicious. 2. In a large roasting pan, place the brisket fat side up. Spread the onion soup mixture on the brisket. Then spread the Heinz chili sauce. 3. 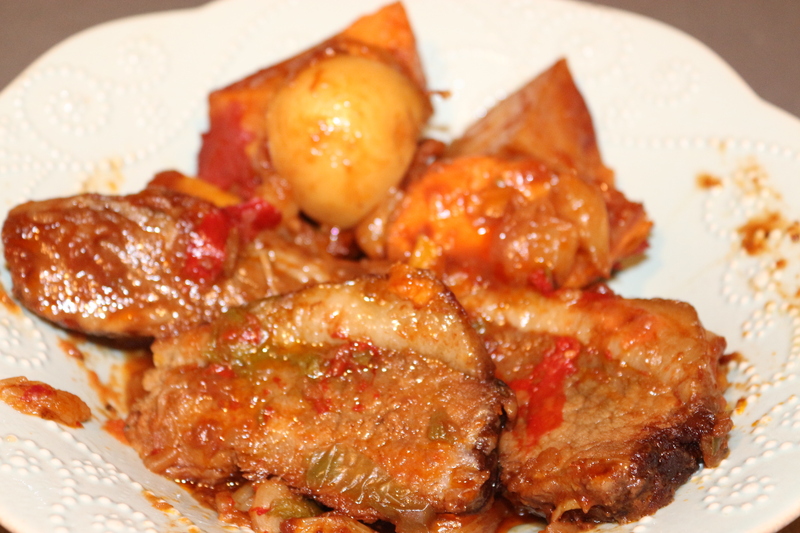 Scatter the chopped up root veggies around the brisket (if you are using them). Then pour the peppers and onions on top of the brisket. Throw the garlic cloves around the edge. 4. Fill the pan up with about 1 inch of liquid (water, wine, broth, your choice). 5. Cover with heavy duty foil and cook on the middle rack for about 2 hours. 7. Bake for another 1 hour if the meat was already fully cooked and tender, or 2 hours if the meat wasn’t fully cooked and starting to get tender. If you go for two hours, check after 1 hour to see if you need more liquid. 8. 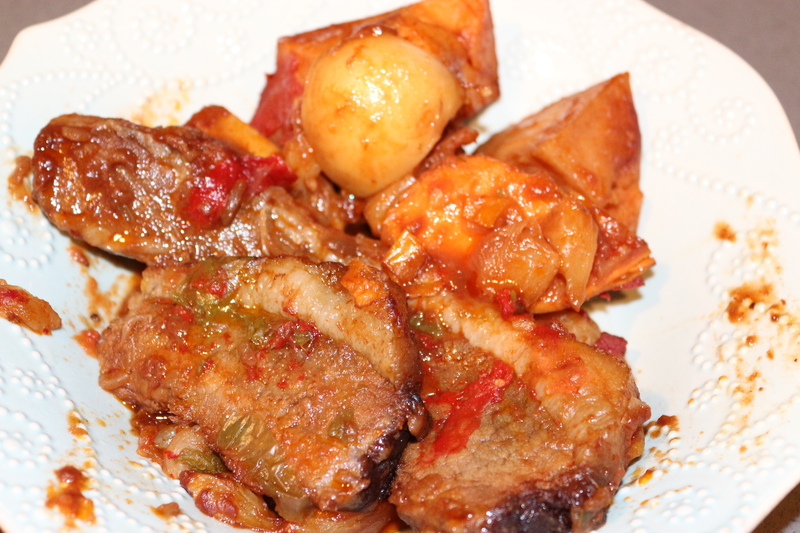 When the meat is done cooking, it will be very soft and flavorful. If you think it’s still a little tough, just cook it some more. The more it cooks, the softer it gets. Feel free to serve it with noodle pudding, or just eat it with the root veggies. This entry was posted in Mains and tagged BEEF, Gluten Free, Jewish Foods, Potatoes, Tomatoes. Bookmark the permalink.